At the beginning of the month, Katie Couric got some heat from gamers over her one-sided, fear-mongering episode about violent game addiction. 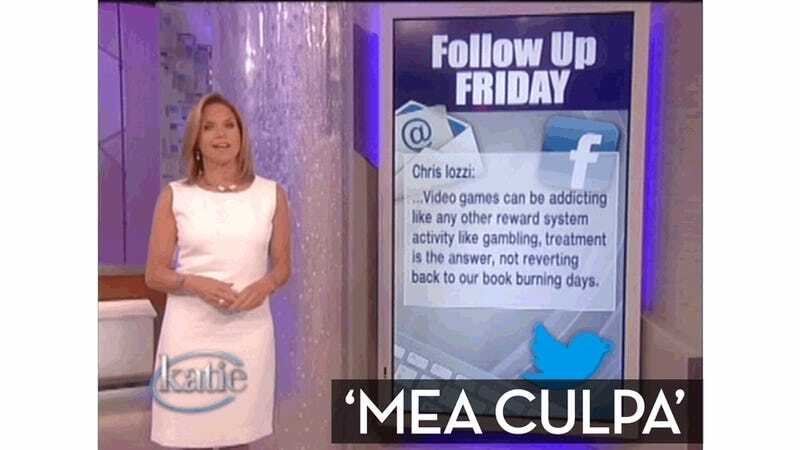 On Friday, Couric gave voice to those dissenters and issued a 'Mea Culpa' follow-up on her show. “Mea Culpa: It probably would have been a good idea to have someone on the other side of the debate” she said, adding that she attempted to reach out to the ESA and Bungie, who both declined to be on the show. I can understand how Katie Couric's producers thought they had done their due diligence. But given how the episode turned out, I also understand why Bungie or the ESA would decline, particularly when they did not have a say on what went into the final edit of the episode. I happen to be a video game researcher who studies aggression and addiction. You might be curious to know that one of the producers of the Katie Couric show contacted me perhaps a month ago, possibly to be on. At the time I warned them about making some of the very claims that were made or insinuated during the show. Obviously the decided not to use me. Ferguson went on to tell me that he’d spoken to their producers for 30-45 minutes, giving them a detailed overview of his research (You may also know Ferguson from Jason Schreier’s thorough piece on violent games research). I remember specifically going over the issues with pathological gaming with them, about 3% of gamers may exhibit these issues, mainly due to overuse leading to interference in other areas of functioning. I cautioned them that comparisons should not be made to substance abuse, and that it remains unknown whether [pathological gaming] is a unique phenomenon or simply symptomatic of underlying problems. I noted that all pleasurable activities have the potential to become “addictive” in a small number of individuals and gaming is not unique in that sense. I also talked to them about the aggression literature, that it is, at best, inconsistent and many of the studies have considerable methodological flaws. I pointed out to them the declining youth violence rates, that other countries that consume more video games per capita have some of the lowest violence rates, and that video game use is not a commonality among mass shooters (I mentioned the spate of high-profile gun violence committed recently by elderly men, for instance). I really love that we live in an environment where people can get called out for presenting a bogus, baseless argument about games. I’m glad that Katie Couric kinda-sorta owned up to doing what she did, and that she chose to present quotes that called her own piece out. This is definitely a step in the right direction. But Couric's producers knew exactly what they were doing when they aired the episode—they had heard dissenting voices and were advised by least one researcher about what was and was not responsible. They simply chose not to include that as part of the discussion. To contact the author of this post, write to chrisperson@kotaku.com or find him on Twitter @papapishu.